Please refer to our stock # mh1 when inquiring. This amazing, over the top, bib necklace is a late design by Miriam Haskell head designer, Robert Clark who worked for the costume jeweler from 1958 to 1968. It measures 18" long from end to end and drapes down a dramatic length of 8" in front. I spoke with another former head designer at Haskell, and was informed that these particular beads were sourced from the Routier Attelier in France. They are hand blown glass and made to resemble lavender jade. 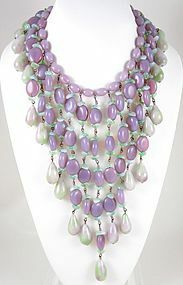 The drops on the fringe of the necklace have an amazing gradation of color from green to lavender. The necklace is quite substantial in weight, weighing almost 400 grams, and the closure ends in a signed "Miriam Haskell" hook. It is in excellent condition, and a true rare find.